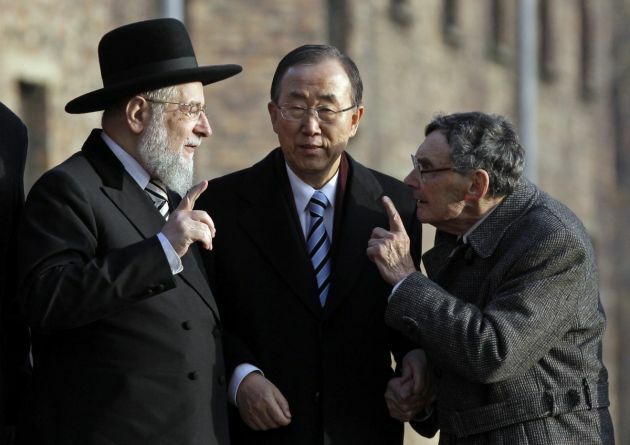 (Photo: REUTERS / Kacper Pempel)U.N. Secretary General Ban Ki-moon talks with holocaust survivor and Council for the Museum of the History of Polish Jews chairman Marian Turski (R), and Tel Aviv chief rabbi Yisrael Meir Lau (L) during his visit to the Auschwitz-Birkenau memorial and former concentration camp November 18, 2013. Ban urged the European Union on Monday to stay at the vanguard of efforts to combat climate change, sweeping aside arguments led by Poland and business leaders that the bloc has to prioritize economic growth. U.N. Secretary-General Ban Ki-moon has visited the former Nazi death camp of Auschwitz to pay tribute to Holocaust victims at a time of growing concern of growing antisemitism in some parts of Europe. Auschwitz concentration camp was a network of concentration and extermination camps built and operated by the Third Reich in Polish areas annexed by Nazi Germany during World War II. The notorious word "Arbeit Macht Frei" (Work Makes You Free) towered above the gate that Ban worked through on Monday. "Auschwitz-Birkenau is not simply a register of atrocities. It is also a repository of courage and hope," Ban said. "Today I say loud and clear: Never again." The U.N. chief also visited Krakow about 50 kilometers (31 miles) from Auschwitz memorial and one Tuesday he joined the U.N. COP 19 climate conference in Warsaw. More than one million people, most of them Jews, died in gas chambers or from starvation and disease and forced labor in Auschwitz and the nearby Birkenau camp between 1940-1945. The first U.N. secretary-general to visit Auschwitz was Boutros Boutros-Ghali in 1995. The Geneva-based human rights group UN Watch urged the world body to do more against mass atrocities as well as to address rising anti-Semitism in Europe as Ban was visiting Auschwitz. "The secretary-general's visit is a historic and welcome development for the leader of an organization founded in 1945 on the ashes of the Holocaust, with the aim to save succeeding generations from the scourge of war and to reaffirm faith in fundamental human rights and in the dignity and worth of the human person," said executive director Hillel Neuer. "The deafening silence and indifference that allowed Auschwitz to happen must serve as remembrance and reminder of the moral imperative for the United Nations - founded as the anti-Hitler alliance - to speak out and take action in the face of genocide, atrocity, hatred, intolerance, demonization, and gross abuses of human rights," said Neuer. He said the United Nations needs to improve its record and focus on the world's "gravest human rights emergencies", and turn international attention to putting an end to mass crimes. "The recent election of gross human rights abusers to the UN Human Rights Council - including a powerful dictatorship that is actively aiding Syria to murder its own people - underscores the reality whereby politics, regional alliances, and vote-trading are too often allowed to trump human rights. Responsible voices must not be silent." "But to draw only abstract and universal lessons from the Holocaust, as the U.N. often does, is to overlook what the Nazi crime was about. "The UN chief's visit to the death camp that symbolizes the Nazis' deliberate murder of six million Jews - as part of Hitler's publicly stated goal of 'annihilation of the Jewish race' - provides a historic opportunity for the world body to recommit itself to the fight against increasing manifestations of anti-Semitism in the Middle East, Europe, and around the world," said Neuer. He noted that it was regrettable that the "annual Holocaust Remembrance Day statements of U.N. High Commissioner for Human Rights Navi Pillay regularly omit any mention of the word anti-Semitism." UN Watch said Ban's visit came 10 days after the European Union Agency for Fundamental Rights released a major poll showing an alarming rise in antisemitism. A survey of nearly 6,000 self-identified Jews in eight European Union countries showed that two-thirds of respondents found anti-Semitism to be a major problem in their countries, while more than 75 percent said the situation had become more acute over the last five years. "Sadly, however, Kofi Annan's historic 2004 UN gathering on anti-Semitism, and his call on the Geneva-based human rights machinery of the United Nations to become 'mobilized in the battle against anti-Semitism,' have been largely ignored," said Neuer. "Few if any of the UN human rights mechanisms - including those experts concerned with racism - have addressed antisemitism in any meaningful way." A recent survey conducted online by the European Union's Fundamental Rights Agency among 5,874 respondents who self-identified as Jews, showed that Hungarian Jews were particularly worried about discrimination and that nearly half have considered emigrating.